Our son’s pediatrician wasn’t familiar with a palm oil allergy or palm oil intolerance. We requested a referral to an allergist, and at our appointment, we asked if a person can be allergic to palm oil. Unfortunately, our son gets very sick from palm oil. This includes anything with palm oil, palm kernel oil, and palm oil derivatives in it, including palm olein, stearic acid, tocopherols, glycerin, red palm oil, mono- and diglycerides, and more. Because of this, we consider him to have a palm oil intolerance. His allergist said there aren’t proteins in palm oil, so it wouldn’t be considered a palm oil allergy. He said there isn’t an IgE test for a palm oil allergy or intolerance. The allergist said we couldn’t do a blood test or a skin test to test for it. Instead, the doctor encouraged us to “build up” his system. He suggested we supplement with prebiotics. He reminded us to avoid processed foods, to eat a wide variety of vegetables, and to increase Vitamin D exposure from the sun. These are all important things to do. However, it wasn’t explaining why he has allergic reactions to palm oil. Also, it was frustrating the doctor didn’t acknowledge someone could have a palm oil allergy, palm oil intolerance or have trouble digesting palm oil. While he is a renowned allergist in our area, he said there wasn’t an IgE allergy test for palm oil, so there was nothing he could do. He dismissed the idea that palm oil could cause problems. Palm ingredients are prevalent in packaged foods and snacks along with cleaning products, and self-care items, like soap, deodorant, and toothpaste. It’s been very difficult finding safe foods to eat and products to use. If palm oil is causing allergy symptoms for you or your child, it won’t matter if it’s organic palm oil or from sustainable palm oil products. We know for certain our son has allergic reactions to palm oil so we avoid them all. We think it’s more than a problem digesting palm oil because even topical products affect him. However, it took quite awhile to figure out palm oil was making him sick. He had been sick for months with congestion, coughing and throat clearing. Sometimes he had a sore throat. Often, he would miss a few days in a row from school. He would use boxes of Kleenex each week. We thought it was environmental allergies but when he eliminated all packaged and processed foods, he was better in days. At first, we thought he was allergic to sunflower oil or coconut or some other foods. However, when we eliminated foods, performed our own food intolerance test, and logged every food he ate and product he used, we were able to figure out it was anything that included palm oil, palm kernel oil, and palm oil derivatives, like glycerin and stearic acid. If you are wondering about a palm oil intolerance or palm oil allergy, it is important you speak with your doctor. And if you do, please note in the Comments below anything you learn. We are hoping more medical professionals acknowledge someone could have a palm oil intolerance, become sick from palm oil, or have adverse reactions from palm oil ingredients. How did we find out he has an intolerance to palm oil? It took a long time to figure it out. I remembered how a year prior he had gotten sick after eating a Great Value brand of sandwich cookie (a generic Oreo) while at a relative’s home. Palm oil was in it, and I thought it was unusual. I wasn’t familiar with palm oil and hadn’t recalled seeing it in foods we ate. Now, palm oil even more prevalent. We started thinking about all the foods he had been eating when he was sick those months. It was in the fall, and he was eating taffy apples and Halloween candy in addition to the usual processed and packaged foods like cereal, microwave popcorn, peanut butter, and granola bars. When we looked at the ingredients, we couldn’t believe palm oil was in every single one of those products. After that, we started reading all food and drink labels. 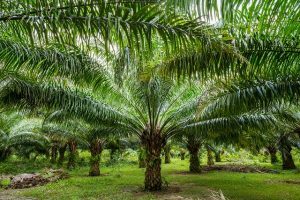 At the time, we didn’t know there are hundreds of additional names for palm oil, including glycerin, glycerol, propylene glycol, tocopherols, and mono- and diglycerides. While it is a huge undertaking to find safe, palm oil-free foods, we were able to find some cereal, peanut butter, snacks, candy, and more products. We’ve featured each of these as posts on this website. Demand for palm oil continues to increase because the U.S. Food & Drug Administration (FDA) banned the use of partially hydrogenated vegetable oils. This is the main dietary source of artificial trans-fats. Food manufacturers are using palm oil as a replacement for the trans-fats. Palm oil is versatile and inexpensive. Palm oil plantationt can remain semi-solid at room temperature, unlike most oils. Also, palm oil prolongs the shelf life of products and is often used to preserve freshness in foods. Palm olein can remain a liquid at room temperature. It’s also highly heat resistant. Companies use palm oil and derivatives to fortify their foods and drinks with vitamins. When you see cereal or milk with a Vitamin A content of 10% or higher, it most likely has Vitamin A Palmitate in it. You will see palm oil in the form of Vitamin E in foods as well. It’s prevalent in personal care and cleaning products, again because it’s so versatile and works in hundreds of capacities. Once you start trying to avoid it, you will see it’s very difficult to find vitamins and supplements without palm oil. We didn’t realize we had been giving my son a vitamin with palm oil. We have yet to find a child’s vitamin without it. Even worse, his allergist suggested we give him Allegra on a daily basis as maintenance. He recommended it because we told him we’d occasionally given him children’s liquid Allegra. After several weeks, we read the label and saw it contains propylene glycol. This ingredient is usually derived from palm oil! Can you imagine how we felt when we learned we were giving him medicine with palm oil derivatives to alleviate his palm oil allergy symptoms? To this day, we cannot find an OTC antihistamine or allergy medication without propylene glycol, magnesium stearate, and/or polyethylene glycol. We’ve learned they are most always made from palm oil. So, what happened to my son when he used something with or consumed something with palm oil? What palm oil allergy symptoms and allergic reactions did he have? Some were delayed and some were immediate. The next morning, he would wake up with a sore throat and need a box of Kleenex from blowing his nose so much. There were other times when he was getting sick from foods, and we didn’t know why. I’m grateful we kept the cereal and cracker boxes from these foods that made him sick because we learned they all contained tocopherols. Tocopherols are sometimes made from palm oil. After my son went through these experiences of being so tired, itchy, and very upset, there was no way we would ever take a chance on him having palm oil derivatives again. Tocopherols aren’t usually labeled as to where they are derived from. We avoid all products with tocopherols. These are ingredients also typically made from palm oil. They are very prevalent in nutrition bars and other types of granola bars. Glycerin is in hard candy, cough drops, and bar soap. My son gets congested from products with glycerin and glycerine. We avoid these ingredients At All Costs. These are man-made ingredients which are often made from palm oil. Food manufacturers use mono- and diglycerides as a replacement for trans-fats. You will see these ingredients now in ice cream, sherbet, Pringles, sliced bread, store-bought baked goods, and many chocolate bars. These make my son so incredibly sick even to the point of sometimes changing his personality. He often becomes completely exhausted and wiped out. They also give him allergy symptoms. It’s difficult to know if palm oil may be affecting you. In our case, some of the symptoms were delayed and others were immediate. His children’s allergy medicine contains propylene glycol and gave him sore throats as mentioned above. Another time, we gave him a liquid children’s pain medication because he had a bump on his tongue (he bit it) which was painful. Afterwards, he had a sore throat. Regrettably, we continued to give him the medicine every 12 hours for two days. I finally thought to look at the ingredients and saw there was propylene glycol in it. I couldn’t believe I gave it to him without reading the label. We stopped giving it to him, and his sore throat was gone the next day. If you see lecithin in an ingredient list, know that it’s a substance found in the oil component of certain plants. Manufacturers use it as an emulsifier so ingredients don’t separate. Unless the lecithin is clearly labeled, as in “soy lecithin,” you won’t know if it’s made from palm. The U.S. Food & Drug Administration has a MedWatch Voluntary Reporting online form you can complete and submit to report your symptoms. Go to this link and click on Consumer/Patient. There are a few pages but it’s easy to complete. This can create awareness and alert the FDA that palm oil is causing health issues. At the very least, it may make them require companies to list palm oil derivatives on ingredient labels like companies must do in Europe. Even though my son has allergic reactions to palm oil, his allergist insists he can’t be allergic to palm oil. The allergist was certain there isn’t a way to test for a palm oil allergy or a palm allergy intolerance. It’s frustrating because we wanted a solution or a least an allergy test to confirm what we already know. We felt it would validate our findings. Instead, the allergist ordered blood work for food allergy testing. They ran tests for common food allergies, a cereal panel, a nut panel, and a general foods list for him. Also, he did a skin prick test for 40+ environmental allergens. We wanted these tests done but we still knew we needed to eliminate palm oil from our son’s diet. Left without a medical name or reason, we continue to avoid all products and foods that contain palm oil and the 500+ names it goes by. This is very difficult to do, but it can be done. Elaeis guineensis is the scientific name for the palm oil companies use in foods, cleaning products, self-care items and more. It’s commonly known as the African Oil Palm. The United States Department of Agriculture has a website where you can learn about the classification of plants. Here is the information for Elaeis guineensis from the Kingdom — Plantae — to the Species — Elaeis guineensis Jacq. There’s concern about coconut allergies being related to palm allergies. Many people who have a coconut allergy think they should avoid palm oil. Please speak with your doctor. Also note, if you experience allergic reactions and think you have a coconut allergy or coconut oil allergy, be sure to discuss with your doctor. This is not medical advice; it’s from the USDA’s website. We included it so you can see the similarities between palm oil and coconut. Please talk with your doctor if you have allergy symptoms or allergic reactions or feel sick after eating certain foods or using certain products. Whether or not someone can be “officially” allergic to palm oil or have a palm oil sensitivity, we are diligent about avoiding it completely. If you are someone who experiences allergy symptoms from palm oil, you should learn how to find products without palm oil. After doing a lot of online research to learn everything possible about a palm oil allergy or intolerance — there isn’t a lot of information out there because it’s not typically recognized by the medical community — I found an amazing list of alternate names for palm oil. It’s from the International Palm Oil Free Certification Accreditation Programme. There are over 500 alternate names for palm oil on it. You will be stunned by all the names palm oil goes by. I highly recommend you print out their list, and then continue reading below for more tips. When I’m diligent about following it — checking every single ingredient against the list — he hasn’t had any issues. I printed out a copy and refer to it — literally — in stores before I buy my son anything packaged or processed. I walk around with the list in my purse. Then at home, before he eats a new packaged food, I double check the ingredients against the list. All of his hygiene items are palm oil free. My son and I have learned some of the hidden words for palm oil to look for so that we can scan ingredient lists quickly. This makes it a lot easier. It’s also been helping my son for when he is out places without me. Also, this helps us to support palm oil free products and to do our part to not support the palm oil industry. Packaged desserts: cookies, donuts, pastries, muffins, cakes/cupcakes, cinnamon rolls, etc. It’s so important to read labels every time. Like our family, you will come to learn your favorites, and it will be a lot easier. Be sure to only introduce one new packaged food (or self-care product) at a time. Even when we checked ingredients closely, sometimes we missed an ingredient or didn’t know an ingredient was made with palm derivatives. Fresh, whole, unprocessed foods are best. Or make changes. Instead of buying desserts and baked goods, make your own. We are in the process of researching other categories of foods. Please look around our website for categories. We continue to update this site. Because my son gets so sick from anything with palm oil, for now, I use vinegar and/or baking soda to clean. If you experience palm oil allergy symptoms, you may want find palm free soap, toothpaste, and more. My son used Lip Serum by Rodan + Fields, and while it healed his lips overnight, he woke up sick with a sore throat, runny nose/congestion, coughing and other allergic reactions. When I looked at the label, I saw there were at least two palm oil derivatives in the product. He missed two days of school from being so sick. Another time, he used soap in a hotel and had the same allergic symptoms. Again too late, I looked up the ingredients online and saw it contained palm oil. If you have allergic reactions to foods and/or self-care items that contain palm oil and palm oil derivatives, it’s a real thing. It may not be an official diagnosis of being allergic to palm oil, but if it affects you, you should try to avoid it. We can only hope the FDA takes notice. You can do your part by reporting your symptoms to them. The increased demand for palm oil is a real issue — most likely for our health and definitely for our environment. Hopefully some innovative companies will start advertising their brands as “palm oil free” just like companies promote “fat free,” “gluten free,” “no high fructose corn syrup,” etc. While still new, there is a palm oil free certification label you can look for. This company ensures all of the ingredients — down to the source — are free from palm oil. It can be great marketing for companies, especially when so many packaged products contain palm oil. We hope more companies will eliminate it from their foods, cleaners, and personal care products. Our allergist said there isn’t a palm oil allergy test as there isn’t an available serum-specific IgE to the oil. So officially, you can’t be allergic to palm oil. He tested our son for all the common food allergies but he didn’t have any except for two false positives, according to the allergist. Therefore, we continue to perform our own food intolerance test to see what his food sensitivities are. So far, it seems palm oil and palm oil derivatives are the only problem. We work hard to eliminate personal care products and food with palm oil so he can be healthy. Even though the allergist said he can’t be allergic to palm oil because there aren’t proteins in it, we know our son gets sick from palm oil. We learned palm oil is a medium chain triglyceride (MCT). Through our doctor and online research, we learned MCTs bypass “traditional” digesting. Meaning, palm oil is absorbed into the bloodstream from the gastrointestinal tract more easily and faster. This is interesting because depending on the palm oil ingredient, our son has some symptoms almost immediately. However, we don’t believe it’s solely a digestive issue or something to do with palm oil being a medium chain triglyceride. Or maybe he does have trouble digesting palm oil and palm oil derivatives, but there is something additional that it does to his body. Palm oil seems to be affecting at least one other system. Some palm oil ingredients give him immediate, traditional allergy symptoms. Some give him a delayed sore throat which leads to a longer-term illness. There are others that affect his entire body immediately or within 1-3 hours, changing his mood and making him lethargic, sad, etc. On separate occasions, when he used deodorant, lip balm, toothpaste, and soap with palm oil derivatives, he had symptoms. Often he became very ill. Sometimes his reactions happened quickly, within 1 – 5 minutes of using them. Other times, they were delayed. For example, he showered at night with hotel soap and woke up sick. These ingredients were absorbed into his body and into the bloodstream through his skin, not digested per se. After a year of logging foods and symptoms, we are absolutely certain our son has an intolerance to palm oil. It’s not a recognized allergen or even a common intolerance. The allergist was focused on boosting our son’s overall health with prebiotics. He recommended this. This is all well and good, yet, we know palm oil affects him negatively. We want to know why. My husband and I can watch him be completely fine, and then eat something with palm oil in it, and have symptoms within minutes. Because of this, we are always researching products without palm oil. As you may be finding, palm oil is prevalent in the majority of packaged foods as well as personal care items and cleaning products. It’s difficult to live a palm oil free life. We started this website as a place for others to find products free from palm oil. Also, we wanted to educate others who think they are getting sick from palm oil, think they are allergic to palm oil, or may have a palm oil intolerance. It doesn’t seem the medical community recognizes people can be sick from palm oil. We are trying to create awareness. As companies use palm oil more and more, consumers are more exposed to it. Here, we want to give you some simple ways to help discover if you may have an intolerance to palm oil or a palm oil sensitivity. We also want to encourage you to talk with your healthcare professional and encourage you to report symptoms to the FDA via their online form. Demand for palm oil continues to increase. It’s in more products than ever before and goes by hundreds of names. Palm oil is hidden under many names, in many products, and it’s used in many different ways. Yet, despite our increased and repeated exposure daily, according to allergists and other medical professionals, you can’t be allergic to palm oil. However, we know for certain it adversely affects our child. Sometimes he “just” has mild symptoms and sometimes he gets really sick from palm oil and derivatives. From our experience, we believe you may be reading food labels and being perplexed as to what is causing you or your child to have symptoms. Perhaps you’re wondering if it might be palm oil or palm oil derivatives. We are not medical professionals. Please seek medical advice from your physician. In this post, we’ve used our own experience to teach you how to narrow down ingredients to see if it might be palm oil and palm oil derivatives that you are intolerant to. We continue to update this post and site. This is essential and can be a simple notebook. Write down everything you eat each day. Draw a horizontal line to separate out each meal and snack time. Do you have any new or unusual symptoms throughout the day? Write down the symptoms in the same notebook you are writing down your foods. Write your symptoms to the left. If you experience them in the morning, write them closer to the top of the page, near the foods you ate early in the day, etc. Are there any products you believe are causing you to have symptoms? Start with what you’ve noticed or what you believe may be the issue. Pay special attention to these products, and be sure to include them along with symptoms in your food log. Be sure to save all the ingredient labels and packages when you can. If you can’t save the package or box, take a picture of it. You will want to reference these in the future. I break down all boxes so they are flat, and I stack them in the cabinet. I can’t tell you how many times I’ve referred to them to reread labels. So many times, I have gone back to empty boxes and packages to read and compare labels and ingredients. Sometimes, it was because my son had symptoms; other times I wanted to compare the ingredients from products that didn’t cause him to become sick. Once, he got so sick after a party at relative’s home. I was glad I took a picture of the ingredients from the ice cream he ate. Weeks later, when I found a list of palm oil derivatives online, I went back to look at the picture with the ice cream’s ingredients. Sure enough, it contained mono- and digylcerides. At the time he ate it, I didn’t know these are often made with palm oil. Only use one new product at a time. Your body comes into contact with so many different ingredients each day. If you can start figuring out patterns of what makes you ill, you can go back to look for common ingredients in products you’ve used before. But if you go grocery shopping, and come home with lots of new foods and other products, and use them all in the next few days, it will be very difficult to find out what is causing your symptoms. Think of it like a science experiment. Keep everything the same and change only one thing (the new product). Watch your variables! Read the ingredients from everything, including from your soaps, lotions, toothpaste, lip balm, deodorant and cosmetics in addition to all food. Do you drink milk? If so, look for Vitamin A Palmitate. If you drink vitamin or sports drinks, check those labels too. Be thorough: If it has a label, you must read the ingredients. When you see something has palm oil or palm kernel oil in it, note that. If you experience symptoms after you eat it or later that day, circle that food. The more you read labels, the more you will learn what to look for in certain foods, soap, etc. Reference lists about palm oil derivatives. There are hundreds of names for palm oil derivatives. The Palm Oil Free Certification Accreditation Programme has made a public list for you to reference to help you avoid palm oil. Palm oil derivatives are in milk (unless it’s whole milk), RTE cereals, candy, bread, baked goods, toothpaste, and so many more things. Start learning what they are. Here we explain common letters combinations to make it easier to look for palm oil derivatives. Learn all you can about how manufacturers use palm oil. Sometimes they use it to fortify foods with vitamins, as in the case with milk and cereal. Other times, they use it to help the consistency, as in peanut butter. In soaps, toothpaste and shampoo, it’s used to create lather and foam. I cannot overstate the importance of keeping labels. It will help you in different ways. Even after I learned alternate names for palm oil ingredients, sometimes I missed some ingredients. This happened to me with Glycerin, Glycerine, Tocopherols, Magnesium Stearate, and Mono- and Di-glycerides. My son got sick from eating products with each of these, and I didn’t know why. I thought they were palm oil free. Palm oil and palm kernel oil weren’t on the labels. It was only after keeping the food journal for months and looking back at the symptoms that I singled out these foods. I was able to go back and look through the ingredients again, and that’s when I saw these palm oil derivatives. I knew to not let my son eat them again. So many times, manufacturers change ingredients. When you save the labels, you will be able to compare the ingredients if you need to. Also, depending on where you live and where companies are sourcing their ingredients, ingredients and labels often differ. You may wonder why a processed food that you ate awhile ago with no issues is now causing you to have symptoms. The reason could be a change in ingredients. Oreo didn’t used to contain palm oil, and now they do. Peanut M&M’s didn’t used to contain palm oil, and now most do. The last time I bought Post’s Honeycomb Cereal, it didn’t contain palm oil, and now it does in the form of Vitamin A Palmitate. It took us a long time to figure out some palm ingredients. We knew certain foods were causing him to have allergy symptoms but we didn’t know why. Keeping your labels organized or at least all in the same place will make it easy for you to reference them as you try to figure out what’s causing you to have symptoms. Again, it seems the medical community isn’t familiar with palm oil allergy symptoms and palm oil intolerance. However, when you look online and in forums, including Facebook and other sites, you will find communities of people who avoid palm oil and palm oil derivatives because they get reactions from it. There are many people who avoid palm oil because of the devastating environmental impacts the palm oil industry has on rainforests, animals and people. For our family, we do all we can to avoid palm oil because of the environmental issues as well. Also, it’s one thing when palm oil would cause our son to cough and have sniffles. It’s another when he is miserable and sick for days or weeks. It’s a very serious thing to us. We don’t want to have our son be sick. While he is a healthy eater and does great eating protein, fruits and vegetables, he still eats processed food. We want to be sure he can find safe choices. We want him to have a piece of candy or gum and not get sick. Our goal is to find a safe vitamin without palm oil. He can only use few self-care products. We bring them with us on vacation. Do you get allergic reactions from palm oil? If so, you are not alone. Depending on the palm oil processing, you may not have allergy symptoms to all food with palm. To the best of our knowledge, all palm oil products and palm oil causes allergic reactions and affects our son adversely. Once you know what products contain palm oil — there are so many more than you think — you will be able to more safely avoid those products. Truly, it’s so important to let companies know we want more products without palm oil and to support palm free products. Please share your Comments below. Do you get sick from palm oil? Do you think you have an intolerance to palm oil? Why do you think you have a palm oil allergy? Will you talk to your doctor or healthcare professional about palm oil? The more attention we bring to this issue, the more manufacturers might start eliminating palm oil from their products. Already it’s a huge environmental concern. Please note, we are not medical professionals. This is not medical advice. Please consult with your physician about your self-care and food allergy symptoms and the possibility of a palm oil intolerance or palm oil allergy. Your allergist or other doctor may suggest allergy testing or other tests. The information is based on my own personal experience. While palm oil causes allergic reactions in our situation, yours may be different. If you have allergic reactions or other symptoms, please consult with your healthcare professional. We’d love to know your experience with palm oil. Do you think you have a palm oil intolerance or allergy? Please let us know in the Comments so we can all help each other. Also, please report your symptoms to the FDA. Thank you so very much for sharing your research and personal story on this. Palm oil is also very damaging to heath in the long run, so its best to avoid it all together. Europe is considering a ban on it which makes so much sense. Only a few years ago the food and cosmetics industry could do well without it. Its fueled by greed as it us cheaper than any other oil. I am happy you found a solution to your child’s intolerance and that he is healthier and happier now. Do look out for professors and university researcher on this topic – they might have more insights into it than average doctors. Good luck!! Thank you for reading and for taking the time to comment with such helpful information. I also appreciate your idea of looking to university research. Once people know how companies use palm oil and where to look for it, it does get a lot easier to find products without it. Many thanks to you! Thank you for posting this information for the public. I have all of these symptoms and have for decades. I had discovered through the same process that I had a soy allergy 20 years ago despite my allergist claiming that I didn’t. I did well until the last few years, it’s getting much worse again. Now I realize that palm oil is another culprit. Thank you so much for clarifying this for me. I suspected it but it is difficult to find affirmation. So here we are, a few days after Halloween. I don’t think I have to explain. Palm oil in everything now. Was not, just 2 or three years ago. Doing research, found this site. I do have a hunch, this ingredient is highly inflammatory. It is just that some, such as your son are showing intolerance (immune response) & you his parents have the keen sense to make the connection of diet, then symptoms. As other reviewer stated, Europe is trying to ban Palm Oil & actually being blamed of inciting a trade war because of it. For now, personal responsibility, which you have clearly illustrated will be your salvation. Thank You Again. Thank you so much for writing. I apologize for the delay in replying. I wanted to thank you because the timing of your response and your mention of Halloween candy containing palm oil was perfect. A few weeks ago, I was able to refer your comment in an email exchange I had with a top executive at a major candy corporation. Typically, when we first write a company, they respond back with their standard “we use sustainable palm oil” response. In this instance, after getting past the customer service person and up a few more levels, I was referred to this person and was able to explain the health component some people experience from palm oil. It’s important for companies to know consumers are reading labels and are choosing palm oil free options for both environmental and potential health reasons. Also, please refer to our post, Halloween Candy Without Palm Oil, as a starting point for some candy we found to be palm oil free. Please continue reading labels as well. Palm oil IS one of the cheapest oils available. Unfortunately as you and I are finding, it’s very versatile which is another reason it’s so prevalent. Like you stated, avoiding processed foods is key. We’ve found avocado oil to be a great cooking and baking oil if you are looking for additional options. And yes, the labels have changed dramatically, especially this year/2018 as the trans fat ban in the United States is now in effect. Thank you so much again and best wishes to you! There is a company called bulk supplements that is sold on Amazon that sells individual nutrients in powder form without any additives. What I like to do is measure a small amount of the ones I really want like the b vitamins and magnesium and c and sprinkle them in some oj. Thanks for this work you are doing to inform people who have ears to hear. I just started to make the connection that the palm kernel oil in a yogurt that I ate and was causing repeated migraines and this was the first resource that I found when I did a search for palm oil allergies. It’s very eye opening but awesome that you have figured this out for your son. I’m going through everything I own and checking for the ingredients you have painstakingly researched, and I’m shocked at how prevalent it is indeed. I also just realized that aspirin that is marketed for pets doesn’t have many additives, but it’s the same aspirin. I just thought I’d add that since you mentioned needing medications for your son. Thanks again, Alyssa. The link for the additive free aspirin you sent got me thinking about getting “stripped down” versions of medicine. I have updated the post above to include how I was able to get two palm oil free medications for my son. We asked his pediatrician to write us the prescriptions to a compounding pharmacy. We are grateful to have these options that don’t include the typical palm oil derivatives, including Propylene Glycol, Magnesium Stearate, Glycerin, Polysorbate 80, Polyethylene Glycol, and/or Sodium Lauryl Sulfate. We will no longer be purchasing OTC medications for anyone in our family if possible. Thank you again! Thank you for thinking of us, Alyssa! Hello Alyssa. Thank you for writing. I am interested to learn about your migraines and appreciate you suggesting the bulk supplements. I went to a compounding pharmacy and was shocked how most every product on their shelves contained Magnesium Stearate or Stearic Acid, both typically palm oil derivatives. Also, the pharmacist we spoke with there didn’t know about palm oil in medicines. Good for you to be diligent about reading the labels for everything in your home. We can vote with our dollars when we choose the products without palm oil. Best wishes to you. I’m 62 years old and I have a intolerance to palm oil. It started about 5 years ago. I can’t eat anything with it. In my case within 10 minutes it starts a urgent bowel release and will continue for hours till it’s all out of my system. I have to read every label. Thank you for writing and sharing your story, Edith. It is interesting to learn the adverse ways palm oil affects people. It’s difficult reading labels all the time, even for products we purchase regularly, but you know how important it is. We are continuously writing companies telling them we want to see more palm oil free products and that we support palm oil free labeling. Please write again if you discuss this with your healthcare professional. Best wishes. Edith, me too. After looking on line I was beginning to think there wasn’t anyone else out there who had this reaction. I began around the same time, 5/6 years ago to eat Fish & Chips (I’m British) and have violent cramps and urgent need to visit the toilet. I tried fish on its own and no reaction, made Fish and Chips at home no reaction…eventually came to realise it was what they were frying it in. I asked at the restaurants and it was all fried in palm oil, often just labelled vegetable oil. I mention this to anyone willing to listen and just get a shrug and shake of the head. I had scans and a colonoscopy before self diagnosing and wonder how many other people out there are diagnosed with IBS when they just have a palm oil allergy!!! Yes, thank you for writing…. Spread the word indeed! So many people have been finding this post. Palm oil is causing health issues. We look forward to when the medical community acknowledges and researches palm oil. We also look forward to when companies start recognizing it’s a marketing advantage to have No Palm Oil labeling. Thank you for your research on Palm oil. I have this allergy to this also. I did not think to look on the tootsie roll bag I bought. I now have blister in my mouth and my glands in my throat are swollen. I usually read everything before eating it! I diagnosed myself 2 years ago with having severe a palm intolerance. It only took 2 months of journal entries to narrow it down after my doctor and allergist said a palm allergy was very unlikely. When I ingest foods with palm, I immediately get red, itchy, burning eyelids, sometimes my cheeks too. Within a minute of eating this happens. Other forms of palm oil in soaps and shampoo don’t seem to have an impact, although I do my best to avoid them. I also find a sensitivity to many laundry detergents more of a body rash. http://www.palmoilinvestigations.org say they are developing a phone APP for palm allergy product identification. One benefit of developing a palm intolerance (that seemed to appear all of a sudden) Is that it has forced me to eat a much healthier diet. Hello. I apologize for the delay in acknowledging your thoughtful comments. Thank you for taking the time to write about your experience. We are sorry to learn you are suffering from a palm oil intolerance. That’s great you have the list of palm oil derivatives to reference and that you’ve found another great resource. We have linked to them in some of our posts and consider them a valuable resource as well. Being the FDA has banned the use of PHOs — also known as trans fats — palm oil is in more products than ever than ever before. I loved reading what you said about the “benefit” being that you eat healthier. We too have looked back on our time since realizing it was palm oil causing the problems and recognize how much healthier we are all eating. It’s a great way to take control of a situation that seems very out of control at times. We wish you the best. Thank you again for your insightful and positive comments. This is fantastic. I thought I was the only person in the world allergic to palm oil. My lips swell and I get (the beginnings of) anaphylaxis. It’s a terrible thing, added to all my other allergies that have landed on my plate at age 55 post-chemo. Palm oil is in freaking everything. Even chicken broth. Just terrible. Anyway, good job. And thank you. Thank you for taking the time to comment, Diane. We are sorry you too have been having reactions to palm oil. It’s frustrating when the medical community has no knowledge of this or way to test for it. We wish you much patience as you read labels trying to find safe products. Be sure to print out the hundreds of names for palm oil derivatives and refer to it before you buy, eat or use any products. Also, we are constantly updating this site with new products. We are afraid to buy chicken broth or even spices. My son became sick from organic garlic that was in a squeeze bottle. All we use for my son now is salt. We buy herbs or use actual lemon, lime, garlic, onions, peppers, etc. for seasoning. I’m going to learn to make bone broth soon! We wish you the very best. Please come back and comment when you find palm oil free products you can safely enjoy. Thanks again for your positive comments. I can’t believe I came across this page today. I have been researching palm oil allergies for years without finding much of anything online. First of, I would like to thank you for creating this page to share information so that those of us that suffer don’t have to feel like we are crazy. I too mentioned it to my doctor and he had the same reply that it couldn’t possibly be the palm oil. Yesterday I took my friend’s daughter to the movies and stopped to get candy beforehand. I got Mike and Ike’s (0% fat) and she picked Milk Duds. I of course completely forgot that milk duds had palm oil. A LOT of it. I usually read the labels but I guess I just wasn’t thinking. We shared candy at the movie and didn’t even get through a whole box. As we were walking out of the movie I thought oh no, I must have eaten too much candy. I had horrible stomach cramps. Then I remember the Milk Duds had palm oil in them. I had to drop her off at home and make my escape before I blew up their bathroom. Luckily I live close, but those are my only symptoms. I get severe abdominal cramping and then the palm oil just wants out. Also, I believe I just have an intolerance and that I can handle small amounts. It seems like a cumulative thing for me as well, wherein I am fine until I ingest enough of it to make me sick. I recently found out that most pizza and pie crusts contain palm oil now. Frozen pizza and all the pizza places that post ingredients online use palm oil. And while I love your idea of making your own desserts, a few years ago when ALL the candy companies started using palm oil instead of cocoa butter, I decided to make my own candy. Unfortunately, they had started using palm oil in the chocolate baking chips. Lastly, I want to thank you for taking the time to write to companies that use palm oil. I do this often in the hopes that they will go back to their original recipe. Good luck everyone in your quest to stay palm oil free. Please excuse me, I think I need a bathroom. Thank you so much for your comment. It’s remarkable you were able to discover Vitamin A Palmitate makes you sick so many years ago. You for sure then have seen how the labels have changed through the years and very much so in the last few years. We researched Halloween Candy Without Palm Oil. If you haven’t seen it on our site already, please look it up. It’s incredible how so many candies include it. Tocopherols, mono and diglycerides, magnesium stearate, glycerin… it just goes on and on. Even Peanut M&M’s contain palm oil now though their regular/original (and a few others) do not. And yes, sadly the chocolate baking chips and almond bark we used to use all contain palm oil as well. It’s in bread and all the crusts you mentioned. We have yet to find a grocery store bakery dessert that doesn’t contain it. Thank you for writing companies. If you are inclined, please report your symptoms to the FDA as well. It’s really incredible you were able to determine a palm oil intolerance so many years ago — kudos to you. Thank you for writing and helping everyone with your knowledge and experience. Wishing you the best…. My latest palm discovery, anything chocolate! If it says chocolate of any type (semi/unsweetened) it is processed cocoa with a plant based oil. Chocolate with cocoa butter or chocolate liqueur, both are made with palm oil. Hershey’s has a good website for finding their real ingredient list, but I had to email Lindt, and Cliff bars. They both use palm oil in their cocoa butter. It’s so important you emailed the companies to ask about palm oil in their products. It’s essential for companies to know consumers care about the products not containing ANY palm oil. If palm oil makes you sick, palm oil makes you sick whether it’s sustainable or not. We hope more people reach out to them — especially on social media — to let them know we want products without it entirely. It’s important to report symptoms from palm oil to the FDA. If enough consumers report, they can learn palm oil causes symptoms and reactions in some people. If a label reads “chocolate flavored” or “chocolaty,” it contains compound chocolate which is flavored with cocoa but gets the fat from vegetable oil instead of cocoa butter. Garlic in a squeeze bottle? fresh garlic is so much healthier, and easy to grow. You could try Miso paste for a good broth base, dried mushrooms work well too. I have learned so much about “convenience foods” and am only using only fresh garlic now. It tastes so much better and stays fresh for a long time. I know for sure it won’t have been preserved or treated with palm oil derivatives. Not sure if this is helpful as I had an “iron gut” and lots of good health until western and eastern practitioners alike decided to improve me. Disaster magnified. In any case, during one of these life overhauls post-consult, I joined the coconut oil craze and was a coconut oil popcorn popping, stir-fry making fool and seemed to do just fine. Years later while trying an oil-pulling experiment to apparently detoxify (it was the internet this time jacking me up), coconut oil started to trouble me much more than previous month’s inklings. I thought I needed to go to the ER for the pain. And then further years down the road with another health overhaul, plantain chips became holier than thou. I again thought I might need emergency assistance after eating a handful of them fried in palm oil. After some internet research, I also stumbled upon a very thorough MCT-oil explanation and its adverse impact on digestion. I can’t seem to find it again, but it was convincing. Not to be Debbie Downer, but maybe keep an eye on your son’s coconut oil tolerance, too. My iron gut is kinda devastated, and those two oils do stand out on a molecular level and clump together for many with digestive issues. Good luck. Thank you for taking the time to comment with your experience, insight and suggestions. For a long while, we eliminated coconut because it bypassed “traditional digesting” like palm oil does. We have been able to reintroduce coconut sparingly without issue (popcorn made with coconut oil) though we haven’t tried cooking with coconut oil yet. Being they are both MCTs, it’s definitely something to watch out for. If you ever find the MCT explanation, please post it here. Thank you so much for sharing your knowledge! What a relief it is to have found this page! I started supplementing with MCT oil several weeks ago, as one of the herbalists at my local Natural Grocers had highly recommended it. She did note that it would probably impact my intestinal track, so encouraged me to start with one teaspoon daily and gradually increase to one to two tablespoons a day. Within a week, not only was I experiencing severe intestinal distress, but I developed a major rash or possibly hives on my chest. I’ve also had intermittent pain in my gut and a runny nose. At first, I was stumped, as there hadn’t been any change in my diet – as I mostly consume organic whole foods and healthy oils, and steer clear of processed food and products high in carbohydrates. I was more concerned about the itchy, raised rash on my chest, and realized that my only dietary change had been the recent daily consumption of MCT oil. So, I started researching allergic reactions to MCT oil and came up empty-handed. I have been convinced that MCT oil was the culprit, and it wasn’t until yesterday that I decided to research allergies to palm kernel oil. Of course, I stopped taking the oil within days of starting it, but decided to reintroduce it, using considerably less. The rash came back. So, I went off it again several days ago, and the rash is just now starting to go away. I can’t help but wonder, however, if coconut oil may also be a culprit. So, from here on out I will start reading labels much more carefully, and concentrate on olive oil and avocado oil. Thank you so much for this post, your meticulous attention to detail, your tireless efforts to get to the bottom of your son’s allergies, and your decision to share your findings and journey with the world! Much, much appreciate! Thank you so much for your kind words, Brooke. I appreciate you taking the time to write. It is very interesting to learn of your experience. Are there ingredients listed on the MCT oil you have? It would be interesting to know if it includes palm oil. Let us know if you can. Wishing you the best. Thank you! I make my own soap and I buy ingredients instead of processed food as much as possible. My doctors want me to take a multivitamin, but I have yet to find one that doesn’t contain palm. I understand what the allergist is saying, because having allergies I have heard often enough that I fam allergic to proteins in certain items. Not sure how a kiwi fruit has any more protein in it than palm fruit, but I KNOW they both make me miserable… so I avoid them. Trying to avoid palm products as much as possible because they give me angio edema and make me exhausted. So glad I found you site! Read the labels, learn the words,the names and the codes, cook everything from scratch. My wife is palm oil intolerant, it effects her by causing her to ingest large amounts of air which can last for days. We cook everything, make virtual everything from scratch. Bread,ice cream, biscuits,cakes, don’t use margarine, avoiding all pre processed ingredients We have learnt to speed read ingredients lists, palm oil pops out rapidly, anything that is doubtful we leave behind In the UK /Europe E470 – E471 additives =Palm oil plus lauryl and all the others mentioned. I suspect that the part of the obesity crisis is being fuelled by palm oil disrupting normal digestive process in some way, or the absorption of certain key things are out of kilter, that’s really just a suspicion! Thanks for writing about what you are doing as you deal with your wife’s palm oil intolerance. It’s helpful for everyone. And yes to speed reading ingredients. Once you know the types of foods it’s in and the ingredients, words, names and codes, they are very easy to spot. Cooking and baking from scratch minimizes the problem. Great point about disrupting normal digestive process or the absorption process…. We are left to figure it out because there isn’t anything in medical literature about palm oil intolerance or people having reactions from palm oil ingredients. Hello I am Cristina from Romania and I am allergic to palm oil. Then IgE test for palm oil allergy exist at Synevo laboratory, they get the sample of blood from you and send it to Germany for examining. Hello, I am allergic to palm oil. I am from Romania, Europe. In Romania the Synevo laboratory makes igE test for palm allergy and send the sample of blood to Germany for results. I have this allergy for 2 years. It is agresive. I am not only allergic to palm oil food, I also am allergic to air pollution of palm oil. I have all the allergic reaction that you described, but I have more, I am suffocateing in the worst reaction from the inhalation of palm oil from the air. I wos about to die. I use Ventolin inhalation to rehabilitate from a suffocate crises. I am trying to find a cure for this allergy . Thanks so much for your thorough article. I discovered I have a Palm Oil “allergy” by a process of elimination. My story. A few years ago I started going to bed every night thinking I was simply going to die one night from what seemed like sporadic, massive waves of head allergies, sore throat, lethargy. The attacks were sporadic enough for me to write it off as seasonal allergies. I would go into mild panics until a Benadryl kicked in. I decided I needed a life change so I began exercising, eating better and removing processed foods from my diet. My sympyoms calmed down… until I introduced protein bars into my healthy plan. I figured protein bars were a good way to get through a long work day. On the 3rd day of eating protein bars (differnt brands) my allergy symptoms came on with a vengence. I had itching, I was irritated, but my most alarming symptom came when my cheeks became numb and I could feel the tingling creeping down my throat. At this point I went on the hunt for the culprit. I kept those protein bar wrappers because I knew there was something in them that was common. By a lengthy process of elimination all signs pointed to palm oil. I am now a human petri dish for any palm oil derivitive. I carry benedry everywhere I go in case I accidently ingest. 3. throat can hurt and/or go very dry. At this point I have normally swallowed my Benadryl. Tonight however, I lay here typing as my “allergy” has progressed down my throat because I wasn’t paying attention and I’m patiently waiting on my friend Ben… Frustrated, I went to the internet to see if anyone has finally posted something worthy about Palm Oil allergies and I found your site. I applaud you for telling your story. I will write the FDA. It has been a long journey for me but the impact is equally exhausting on my family as I’m sure it was/is on yours. Thanks so much. Thank you so much for taking the time to create this website. As others had mentioned it’s very difficult to find out about palm oil allergies. I was having stomach issues for about a year which caused an irritation of my stomach. I felt like I couldn’t catch a full breath, felt overly full all of the time, my stomach was in pain and it hurt to touch my abdomen. I was convinced I had gallstones due to the pain and eventually did an elimination diet. I found the culprit as soon as I ingested palm oil for the first time. It happened to be a rice cracker and the only other ingredient was palm oil so I feel lucky I was able to diagnosis so quickly. Before this I didn’t even know what palm oil was which is crazy considering it’s in so many products. I’m sure there are so many people out there eating it and have no idea what is causing their problems. This week I started eating a bag of dried organic coconut slices from costco and as the week progressed my symptoms started to come back and got worse as the week went on. I finally realized today it’s probably the coconut. Interesting to read that there is a correlation for people with these two foods/allergies. Thank you for taking the time to write, Sarah. That’s wonderful you were able to figure it out. If you talk with your healthcare professional, please write back. We’d love to hear if the medical community is becoming aware of people’s issues with palm oil. Best wishes! Thank you so much for writing this. I believe I have a palm oil allergy as well. I have had allergy testing done and was told that palm oil shouldn’t be the cause of my symptoms. I did my own elimination and found that palm oil was the common ingredient. It is definitely difficult to find palm free foods! I knew of it’s common names, but am so thankful to you for posting all of the names for it. I will be copying that and carrying it with me! My symptoms are similar to your son’s. I also have anxiety, tightness in my ears and head, sore throat or ears, sinus drainage (which was almost constant until I started to eliminate palm), loss of energy, bloating and other intestinal issues, shakiness, and just not feeling right. I know right off if I see a palm name, other times I have been stumped, but now will look for the other names for it. This started about 9 years ago when I purchased red palm oil from Trader Joe’s. I used it once to cook fish and was very sick. Initially i thought it had been the fish. It wasn’t until a few years later that I realized it was palm oil. I actually never used that oil again though, the thought of it with the fish made me sick. I searched this today due to feeling unwell. My family and I went to a movie last night. I get Mike and Ikes because they do not have a palm ingredient like other candy, although now I will recheck the ingredients. I’m not feeling well. Head and sinus pressure, sore throat, upset stomach. I know that microwave popcorn contains palm, so probably movie theater popcorn does as well…I did have some. Thank you again for this post. I pray that more companies turn away from palm oil, and that your son can also find some relief. Thank you for sharing your experience with palm oil and your symptoms. That’s great you are reading labels and learning the ways it’s hidden. While we are diligent about everything my son eats, there have been times he reacts to an ingredient. Once I contacted a company because he had a reaction, and it turned out the “natural flavors” were derived from palm oil. In your instance, it may have been the popcorn. In addition, it may have been the candy. While ingredients and vendors change, the Mike & Ike’s we’ve seen typically contain Medium Chain Triglycerides. We haven’t confirmed with the company they are palm oil derived; however, palm oil is a medium chain triglyceride. Additionally, we avoid non-chocolate candies — especially ones in pieces or any chewy ones — as they often contain palm oil derivatives. Please see our post, Halloween Candy Without Palm Oil for some safe options but please read labels before buying them. Thank you for sharing your experience of the medical professional saying palm oil shouldn’t be the cause of your symptoms. We really appreciate you taking the time to write. It helps everyone who is trying to learn about getting sick from palm oil. Best wishes to you….